This South African from Namaqualand came into Australia 20 or so years ago called runcinata. The name was corrected this century and runcinata was applied to another more insignificant plant. When I was chasing a South African salvia last century one of their botanists said they don’t take a lot of notice of them! Knowledge is improving so much now there is wide use of the internet! When I first saw namaensis I found it very difficult to believe it was a salvia. Its small crinkly foliage looks like one of the scented pelargoniums. 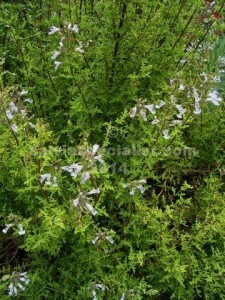 The lavender flowers are very small but it forms a dense small shrub towards one metre in height. It is frost and drought tolerant. If you think you want to shape the plant start early as older wood takes months to grow back when cut. Most of the South Africans seem to grow slowly and steadily which also applies to cuttings but there are seeds usually and variations occur from seed grown. Namaensis has a very pleasant variation called ‘Finngrove’. Its leaves are larger than namaensis but still ferny and very attractive, its flowers are also larger and for a very long period. I recommend ‘Finngrove’ rather than namaensis, especially since the latter is out of stock as at March 2017.